GATEAU DISASTER! It was going so well but you know what I learnt this week, don't put hot jam on fresh cream and chocolate sponge. Duh! I got my recipe from The BBC Good Food website and it did taste great. The cake recipe was really lovely and pretty easy and the off cuts tasted yummy! 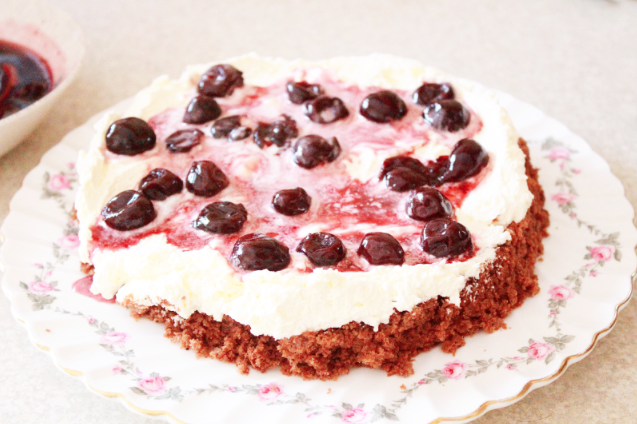 I was enjoying layering the gateau with homemade cherries stoked in Kirsch jam with whipped cream and my chocolate sponge. As I added the layers I could see that the cake was starting to collapse in itself and I had no idea why! gone! ARRR! I bake while Lux, my daughter naps so sometimes I have lots of time and sometimes I have none. She was starting to wake so I wanted to finish the laying quickly, I didn't realise that the jam was still cooling from when I made it and basically the cake melted! I tried to save the cake by covering it in blue frosting but I didn't use enough icing sugar in the mix so it just dripped off. ARRRR! At this point I was pretty frustrated and miserable. I totally feel for Iain from show who threw his melted Baked Alaska in the bin! If this cake wasn't so tasty I might have done the same. I walked away, had a cuddle with Lux and got over it! I didn't want to waste it so it was time to make the most of this mess! I decided to use ramekins to make a dessert. I stuffed the ramekins with the sponge, cream and cherries and pressed it down. I then decorated them with the shades of blue frosting to create a "splash" effect for the mermaids tail. I made the mermaids tails from white chocolate with pink food colouring, the shapes not great but at this point I was just pleased to be carrying on! Then I made it all OK by sprinkling lots of edible glitter on them! That fixes everything! I also got these sweet little white pearls that are supposed to look like little bubbles, cute! And there you have it, my Synchronised Swimming Mermaid Desserts AKA Baking DISASTER! I'm quite pleased with how they look given the circumstances and they are tasty! 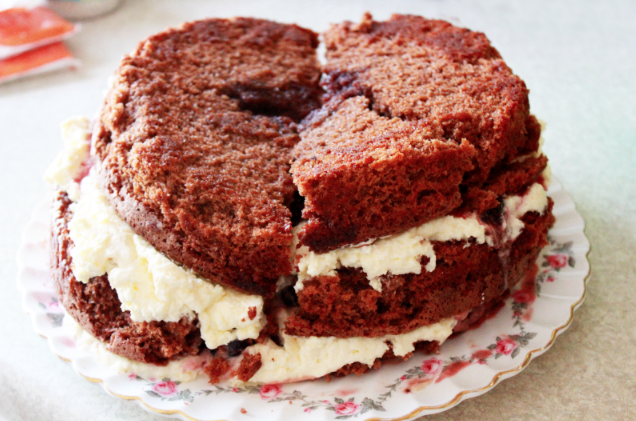 I learnt an important lesson this week, first off don't put hot jam on fresh cream and chocolate sponge but I also learnt thats its only a cake so don't stress about it and eat it!